The term hallux valgus actually describes what happens to the big toe. Hallux is the medical term for big toe, and valgus is an anatomic term that means the deformity goes in a direction away from the midline of the body. So in hallux valgus the big toe begins to point towards the outside of the foot. As this condition worsens, other changes occur in the foot that increase the problem. One of those changes is that the bone just above the big toe, the first metatarsal, usually develops too much of an angle in the other direction. This condition is called metatarsus primus varus. Metatarsus primus means first metatarsal, and varus is the medical term that means the deformity goes in a direction towards the midline of the body. This creates a situation where the first metatarsal and the big toe now form an angle with the point sticking out at the inside edge of the ball of the foot. The bunion that develops is actually a response to the pressure from the shoe on the point of this angle. At first the bump is made up of irritated, swollen tissue that is constantly caught between the shoe and the bone beneath the skin. As time goes on, the constant pressure may cause the bone to thicken as well, creating an even larger lump to rub against the shoe. 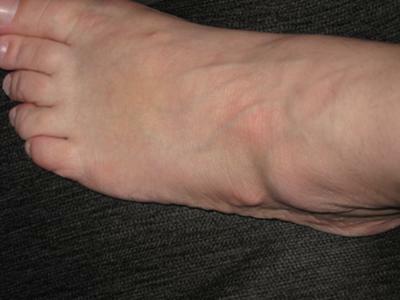 Most bunions can be treated without surgery. But when nonsurgical treatments are not enough, surgery can relieve your pain, correct any related foot deformity, and help you resume your normal activities. An orthopaedic surgeon can help you decide if surgery is the best option for you. Whether you?ve just begun exploring treatment for bunions or have already decided with your orthopaedic surgeon to have surgery, this booklet will help you understand more about this valuable procedure.